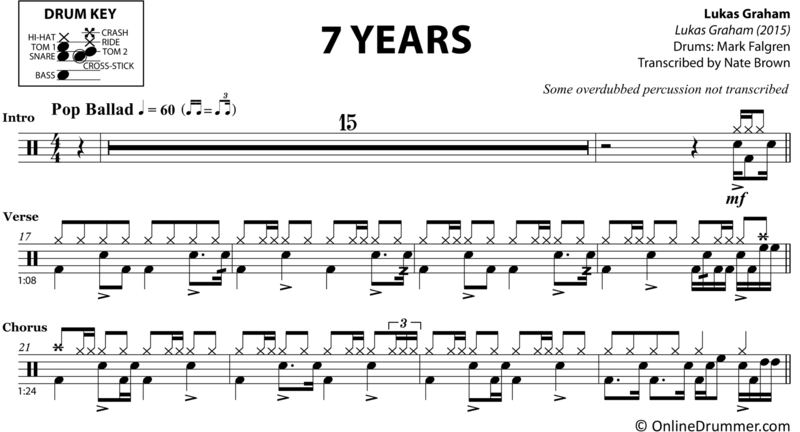 The full drum sheet music for “7 Years” by Lukas Graham from the album Lukas Graham (2015). Play along with Mark Falgren and Lukas Graham in this chart-topping hit. Falgren plays with a swing sixteenth technique to give the groove some bounce and uses creative diddle and buzz stroke placements to fill the part out. It’s important to note that there are overdubbed percussion parts throughout the album version of the song. We’ve notated Falgren’s drum set part.